Skin Reviver No.91 Review: Does it Really work? Bobbi Brown Skin Reviver No.91 Review: Does it Really work? For those times when there is no way you can avoid getting stressed or, when you are getting too little rest and sleep, give your skin more of what it needs by nourishing it with Bobbi Brown Remedies Skin Reviver No.91, US $45 for 14 ml. Restores the energy of your skin cells to restore healthy metabolism and other rejuvenating and regenerating skin functions. Replenish lost nutrients from your skin to restore your skin’s overall health. Provides your skin with a significant antioxidant boost that revitalizes your skin and protects it from fatigue and further damage. Brightens your complexion for a more awake, more youthful appearance. This product has been formulated by Bobbi Brown, a brand that started off as a cosmetics company with products first conceptualized by the celebrity makeup artist with the same name. Chlorella Extract : Has anti-inflammatory properties that relieves skin of irritation and multiple signs of skin aging, while also improving collagen production to restore skin health, including elasticity. Energen Complex : A marketing term possibly describing this product’s the energy boosting components of the formula, reviving healthy skin cell functioning and speeding up repairs and regeneration activities. Power Greens Ferment : “Extracted from antioxidant-rich greens, ” according to the company website, this must be made from a botanical complex consisting of plants with the highest antioxidant contents. Use Bobbi Brown Remedies Skin Reviver No.91 after cleansing and toning, ideally under your serums and moisturizers to get the product as close as possible to your skin. 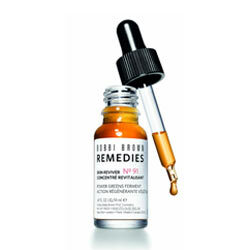 For best results, use with Bobbi Brown Skin Reviver. Product currently comes with 4 free mini product testers if you order it from the Bobbi Brown Cosmetics website. 76 per cent claimed that they saw more radiant skin. 75 per cent of users said that their skin felt refreshed and full of vitality. 73 per cent said their skin was relieved from dullness. Manufacturer fails to openly disclose this product’s full ingredients list, not even describing in detail the marketing terms it has come up with to describe what this product is made of, which seriously limits information about what this product can do, why it is beneficial for your skin, and if it is safe. Bobbi Brown Remedies Skin Reviver No.91 could have been the next best pick-me-up product that you can add to your routine for those exceptional days when you seriously lack sleep and your skin feels like it is hanging by a thread. Sadly, this product is being sold like some magic potion with the manufacturer telling you to simply believe its claims. When you are a smarter consumer, however, that just don’t count.